Before we start, theres some basics that you need to understand. 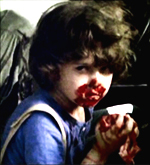 You should always remove the black borders that surround the video when ripping a movie. To do so, they must be cropped off right up to the picture's edge. Interlacing is best described as your DVD is made up many more frames per second than you think. Say you have a PAL DVD youd think it has 25 fps but actually it has 50 & if you ripped it without de-interlacing you will end up with what can only be described as a comb effect in your picture. So we are going to do a very basic rip with gordian knot whilst cropping & deinterlacing to get the best results. Step 1 is for copying your DVD to your hard drive into a folder which you can do with DVD Decrypter yourself, but dont forget to set it to decrypt in File mode. I'm not gonna explain this bit as theres hundreds of guides for DVD Decrypter online & its a very easy to use program. Click Step 2 Prepare the vobs. 1: This is the slider to move quickly through your video. 2: These 2 buttons move your video forwards & backwards 1 frame at a time. 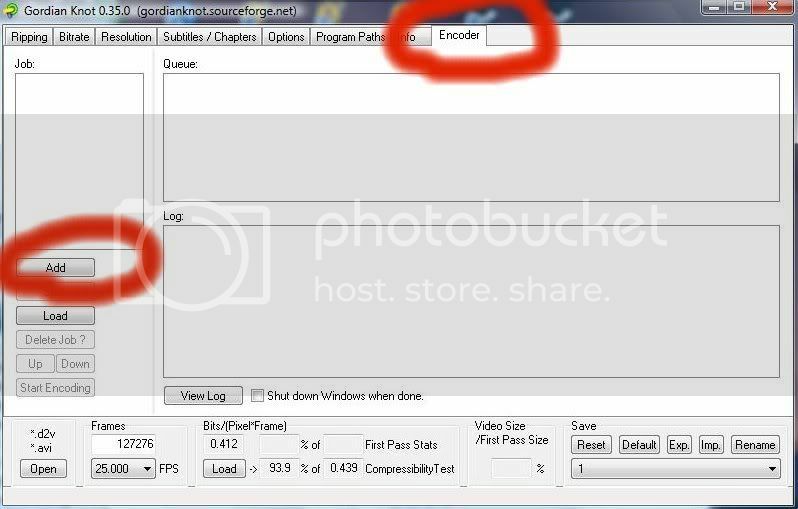 3: This is where you can select an end point for your video. In the above picture you can see that the film actually finished there. 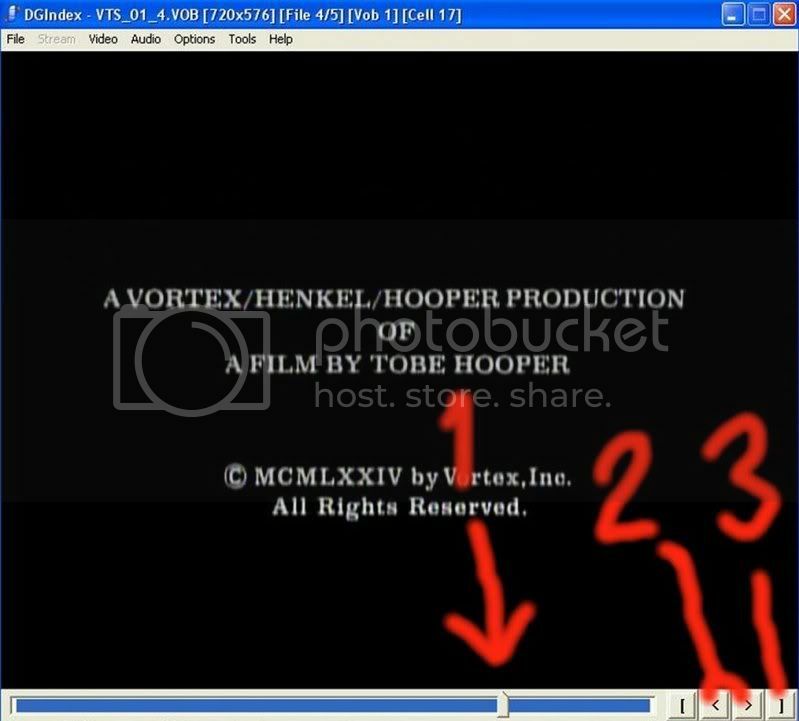 The reason for this is because there was some extras in the same vob file as the film so you scroll to near the end, move forward 1 frame at a time & when youre done, click the end point button to cut off the remainder of the vob. 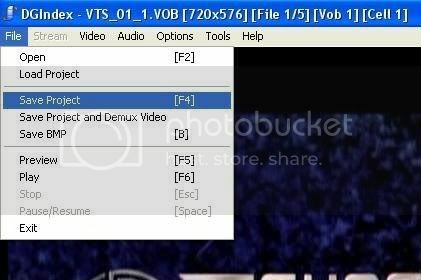 Now click file, open & select your film vobs from your folder. Click ok & you're back at a blank window again. The circled information is the important bit. I've used 2 examples here. 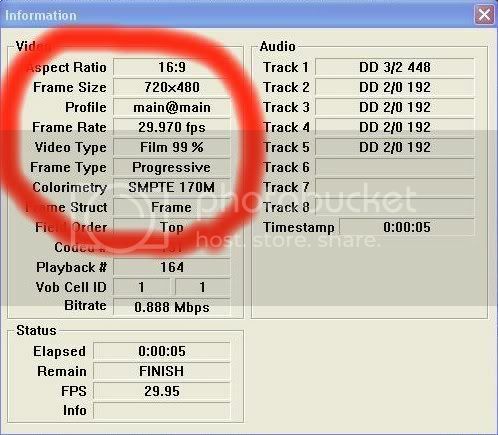 Note the Aspect Ratio, Frame Rate (Fps) & Video Type. The most important bit of information that is displayed here is the video type. 99/100 times you will simply be saving your project & deinterlacing with GK itself (not DGIndex). The recomendation as explained to me is as long as it doesnt report Film 90%+ everything is good. As you can see in the first example, I had one that was Film99% so we use DGIndex to deinterlace. 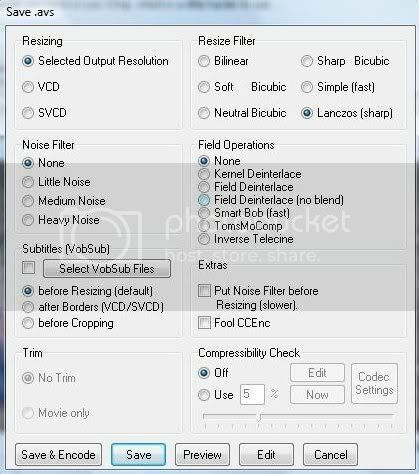 Click: video, field operation & tick forced film. For anything else & remember the above is very rare, dont change the default. Notice that Forced Film on the first example has reduced the FPS from 29.97 to 23.976. All NTSC films must be reduced to 23.976 to be properly deinterlaced & if yours is 29.97 & youve not needed to force film, we will do it in GK shortly. Once its counted down to 0:00:00 Thats DGIndex finished with. 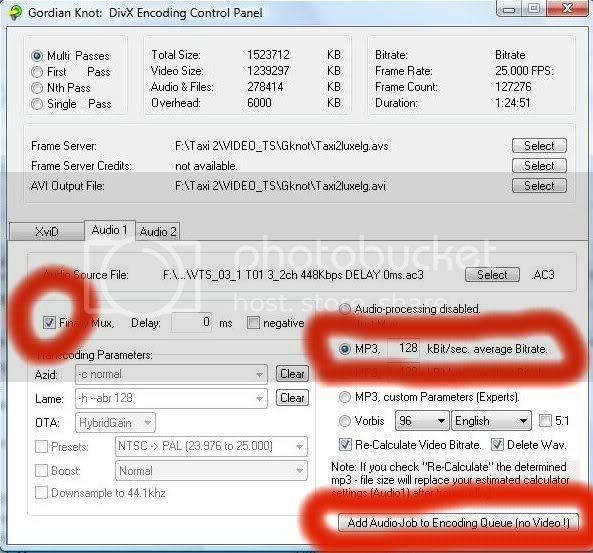 If it hasnt closed itself & popped up a video window in GK, then close it manually & move to the bitrate screen in GK. 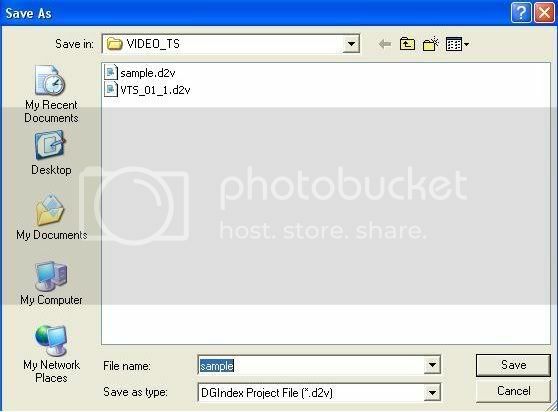 Click open & load your d2v file & up will pop a video window & if its in your way at all, just minimize it, dont close it. Now I'm going to use the second example, the PAL non forced film DVD as an example as this still needs to be cropped & deinterlaced. From the info window in DGIndex we know its PAL Input Resolution & that its 4:3 not 16:9 so I changed that. To remove the black borders, first click Auto crop. Now scroll through the video & look to see if its removed everything that needs to be removed. If not, highlight pixel & use the 4 boxes to continue to crop. Once you are done click smart crop all. Now look at the aspect ratio & you will know if you need to slightly resize the video. This DVD is 1.85 as its stated on the DVD case but GK has shaped it to 1.73, so to reshape it is quite simple. EDIT: If your DVD is Anamorphic, go to the options tab & untick the Follow ITU-R button. If its not Anamorphic or this doesnt correct it for you then go back to the resolutions screen. In output resolution you can increase & decrease the resolution with the up/down arrows between the WidthxHeight numbers. I increased mine to 704x384. If The H-Zoom or W-Zoom go into the red, you should really reduce the size to the next one down although I had a 102% zoom on this & left it alone. Well one thing you should write about more is cropping properly for the correct resolution and A/R. You suggest using the smart auto crop, which is fine, but I think you should mention the 'proper' resolutions, IE '720', '704', '672', '512', etc. And sometimes, GKNot's A/R "error" is incorrect; well not that its wrong, just that the intended A/R of the DVD may include black bars, which with XVID avi's should be cropped out. If your film is interlaced then we must deinterlace it but before we do, theres 1 more thing left. Set your container to AVI. Set your codec to XviD. Decide how big you want your file to be. Default is 700mb although its becoming more regular to do a 744mb 1cd or 1488 2cd rip now. Adjust this with the up/down arrows in the bottom right hand box first then tell it how big youve chosen in the 1CD= box. 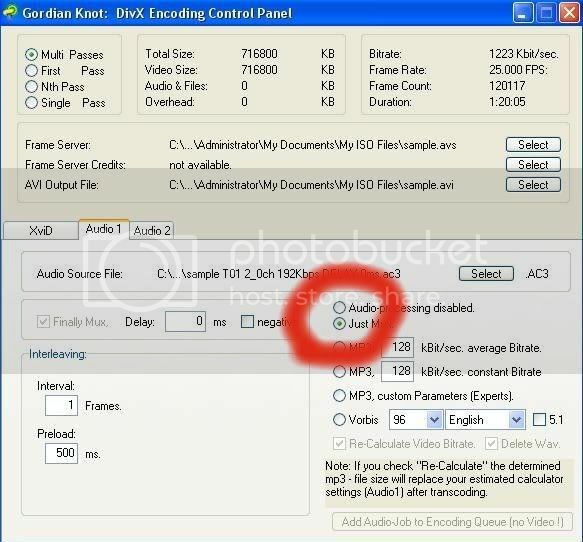 Now add your audio stream in Audio A. DGIndex stripped all your audio streams into your vob folder when it created you D2V so if youre not sure which to add, simply go into your folder & play them to hear which is which. Once added, set the type of audio it is (AC3, CBR MP3 or VBR MP3) in the Audio 1 box in the interleaving & AVI overhead section. Now we're ready to start. Go to your video window & click save & encode & up pops another window. Noise filters are for removing grain. Default is set at none. Sharpness is default Lanczos sharp. 1. Did you force film? If yes set as none. 2. Is your film 29.97 NTSC & Interlaced? If yes use Inverse Telecine. 3. For everything else I suggest Field Deinterlace No Blend. Feel free to preview the filtered rip by clicking the preview button & judging whether you might like to try a different deinterlace option or sharpness etc. Now go to compressibility test, tick use 5% & click now. Wait a few minutes & this is going to give you a guide as to how good quality your rip will come out. the lower the percentage, the less likely your rip will come out nice. A guide would be to aim for 80%. 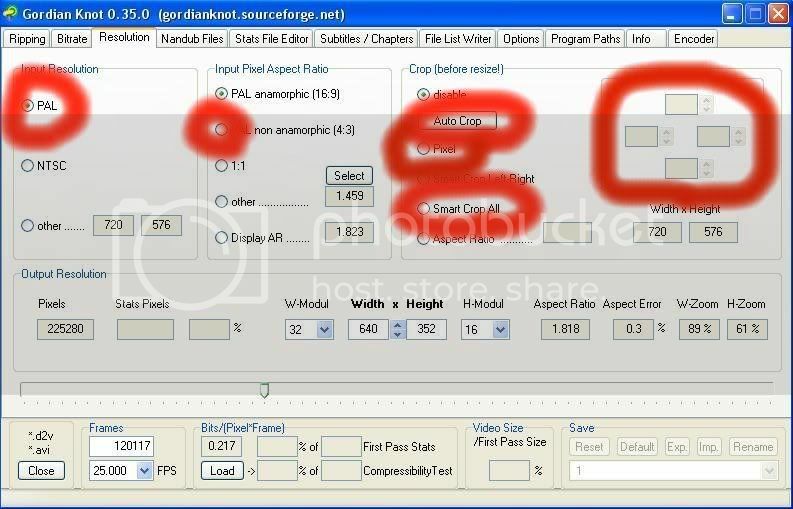 If your percentage is low, maybe you should increase the size you're going to make the rip, reduce your resolution or reduce your AC3 audio to a VBR MP3. Always run another compressibility test after youve changed any settings. To modify your audio to MP3 from AC3 is straightforward. Click the Encoder button top right & click add. First tick the Average bitrate box. Next untick the Finally Mux box. Click yes & up will come the following. Wait for besweet to encode your audio & then go back to the Bitrate screen. In Audio A add your MP3 & in Audio 1 change this to VBR MP3. After the compressibility test is done, its displayed here. Happy? Now click save & encode & save your sample.AVS & you come to the penultimate screen. Highlight Multipass at the top. If you're using inverse telecine the IVTC in AVS-> box will be available to tick so tick it. Click first pass & make sure its sets as 2 pass first pass. Edit: I've just added some advanced XviD settings to the bottom of the guide but if you're unsure then don't change anything & leave as they are. Now click 2nd pass & be sure its set as 2 pass 2nd pass. The IVTC checkbox highlighted again just for clarity. Now go to audio 1 tab & select Just Mux. Now up pops your final screen. Click start encoding & that should be it. Go to bed, wake up in the morning & you should have a rip ready to watch. EDIT: If you get the error 'could not find stats file' & youve set everything right in the first pass & second pass then you need to go to the options tab & click Delete Registry Keys button. I have a friend in New Zealand whos gone & bought for me the NZ only DVD release of Kung Fu Vampire Killers. He ripped it with AGK as hes very new to ripping & unfortunately it didnt crop right. So I guided him for a couple of hours via msn & screenshots how to use GK. Hes got everything right that I can see but when it came to hit start encode he got an instant error 'could not find stats file.' I instantly remembered getting that error myself so made him go back & check he'd set his first pass as first pass & not as 2nd pass. He proved to me with screenshots that hes got this right but hes still getting the error. Anybody able to give any suggestions as to what else it could be & how to resolve this problem? Clear your registry settings, i think the tab is called "Settings" there will be two boxes for clearing/restoring default settings. 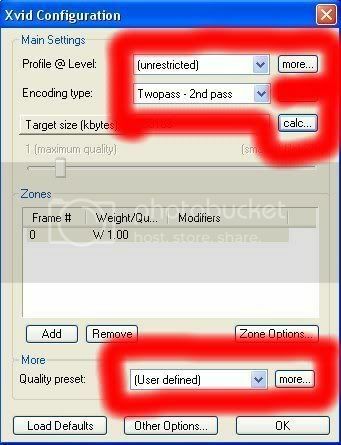 You need to do that for your codec settings, the problem is there's a duff entry for your stats pass. its happened to me before, and that's always fixed it. its big buttons under options on the gknot gui, but that in turn cleans out registry settings for you. I think the tab is either "options" or "settings". iirc two buttons are at the top left of the screen. At the bottom right there's your default settings for 1st/2nd passes. Just 1 more thing. GK will remember your settings if you close it & after youve ripped. If you come to do a different DVD & want to clear all your previous settings, click reset button which is bottom right on any tab. I'm pretty sure thats covered all the basics & as I stated, this is a beginners guide. There is far more to Gordian Knot than this but find your feet first then start asking questions. Thanks to Spud, Lux, Rogue & Vae for their help in guiding me to understand enough to be able to make this guide & Grind for extra input. MORE ADVANCED SETTINGS FOR EXPERIENCED USERS ONLY! 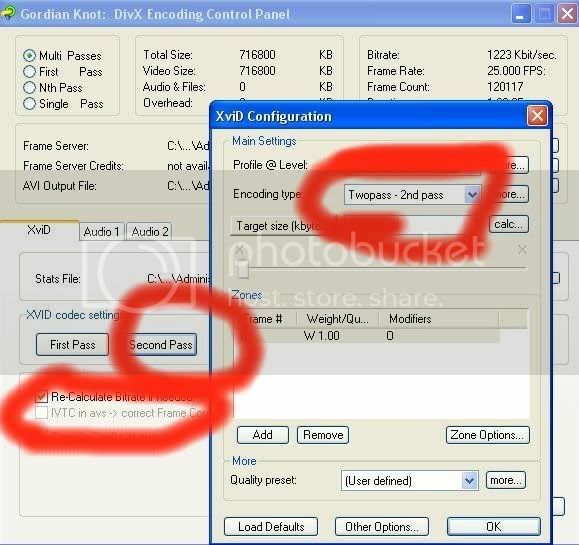 Go to the Options tab & you will see XviD Default Codec Settings with buttons for first pass & second pass. Note: It is essential that you set both first & second passes exactly the same or you will get error messages! The highlighted sections are the only parts that we are going to use as the rest are unimportant at this stage. 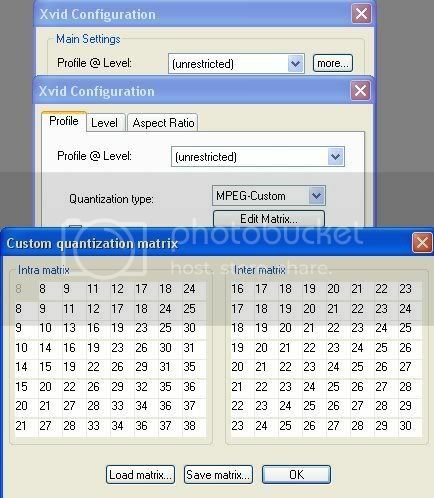 First change 'Quantization type' to 'MPEG Custom'. This is the most important selection of options & I recommend you to set yours exactly like this. Quarter Pixel, Global Motion Compensation & Packed Bitstream are what will make your rip not work on standalones so be sure to untick these boxes. 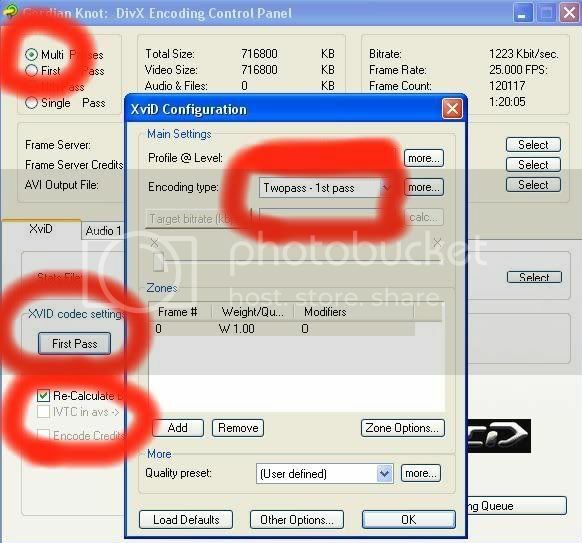 Max Consecutive BVOPs is to set how many BVOP frames you want together in your encode. 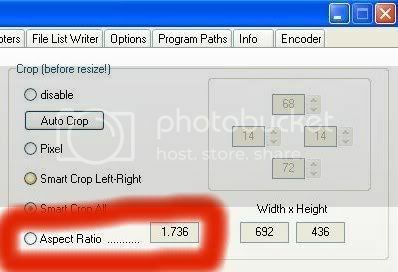 Quantisizer Ratio & Quantisizer Offset handles the size of your pixels & this has worked out to be the best setting for me & was suggested to me by Lux. The Level & Aspect Ratio tabs are unimportant so we dont need to change anything in those. Edit:If your rip comes out oversized this is likely to be caused by you having a low compression ratio & can be fixed by changing the values above. They are set to a quant of 3.6 ( 2 x 1.3 + 1) which is for quality & by following the information in the quote below you can reduce the quality & thus remove the oversizing. Thanks to elchupacabra for pointing that out. -Max Consecutive BVOPs: Here you can limit the number of B-frames in a row. 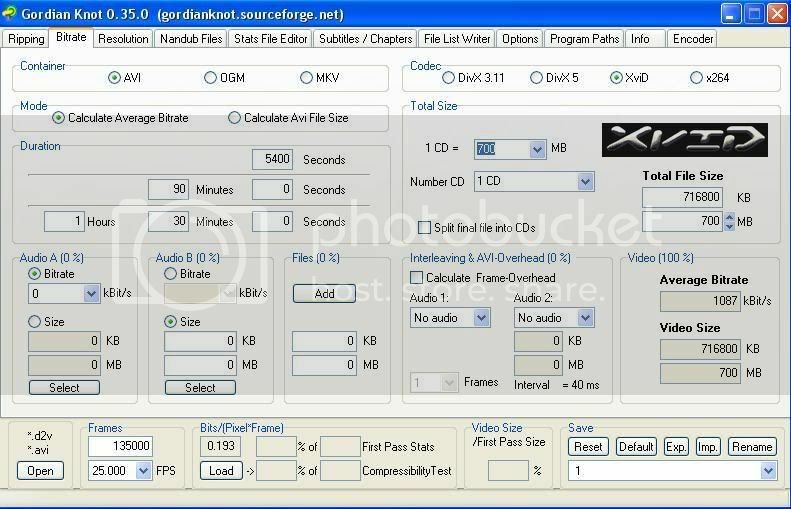 Recommended settings are 0 for off, 1 for DivX 5 compatibility, 2 for best effect and 3 for intensive use. -Quantizer ratio: Multiplying the (average) quantizer of the surrounding non-B-frames with this value will give you the Quantizer of the B-frame. So if the two adjacent frames have quantizers of 2 and 4, the average quantizer will be 3. Multipying this with a quantizer ratio of 1.50 will give you a B-frame with a quantizer of 4.5. -Quantizer offset: Take the result of the calculation above and then add this value. With a quantizer offset of 2.00 you will end up with a quantizer of 6.5. As a rule of thumb, upping the latter two values will give you lower quality B-frames. Simply click Load Matrix & navigate to where it is stored & click OK.
Save Matrix button is for if you're clever enough to have designed your own. After you've made these changes click OK until you return to the first screen again. 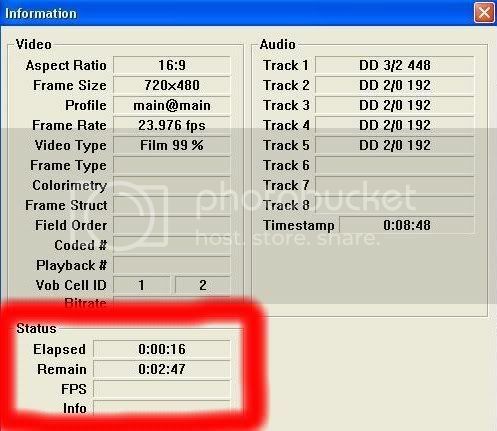 Setting your film length, framerate & Audio type automatically sets the bitrate for the rip & this works perfectly in VirtualDub. Click OK & go back to first window again. Set your settings to those above. If you have a slow PC you might want to tick the Turbo button as it does what it says at the cost of a negligable amount of quality. Maximum I-Frame interval is what allows you to be able to fast forward through your finished rip. Without I-Frames (Sequencing Frames) that wont work. 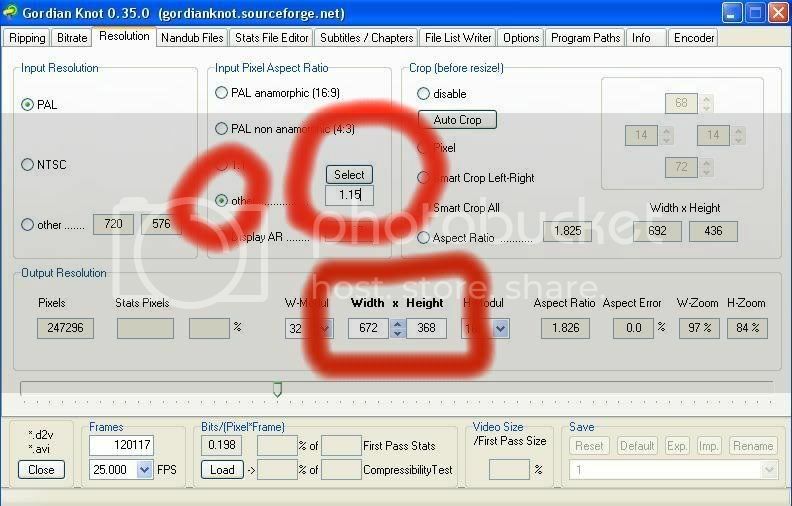 Set it to 250 if your rip is 25FPS, 240 for 23.976FPS or 300 for 29.97FPS. Now click the Quantization tab. Not much to do here. Just tick the 'Trellis Quantization' box & thats you all setup. Click OK on all windows until you come out of XviD setting. To Come: Basics on how to apply filtering & AVS script modifying. Last edited by BadBugs on Mon Jan 12, 2009 1:18 pm, edited 11 times in total. Feeback on any errors or omissions I've made would be appreciated. I'm not to good with this either, so I will try this as soon as I have the time to start ripping again. Great guide, and a big thanks for all your effort. Added Info on resizing Anamorphic DVDs & a resolution to the common 'can't find stats file' error. Thnx for this great guide!!! Can any expert please point out about matrices and which one to use in which case? Also, I have a very crappy quiality DVD, on which the sceen (the film that is) moves from one side to the other (editing or roll placement), thus cropping doesn't come out nice. Is it possible to fix it by selecting those different scenes to crop differently (and how?) <--- For this I was trying to rip those specific scenes, crop right and equal the screen size, then with virtual dub replace the affected scenes with the new better cropped ones, but failed with audio issues ... perhaps I'll need to demux the audio, insert the video and then put back the audio (but this will carry another problem: audio desync). Also, how can I put different filters? Is it possible to edit the avs file before starting coding? Matrices there seems to be a lot of. 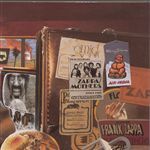 The most favoured ones from what I've seen seem to be the Jawors 1CD & 2CD, EQM V3HR & EQM V3UHR. As for which to use depends on your DVD as what works best for 1 DVD may not be good for another. That is trial & error. (Be prepared to re-rip a few times to get the perfect rip). AVS scripts can be modified before you do your compressibility test by clicking edit before clicking now. To change before your final encode, click the edit button next to the preview button before clicking save & encode. (AVS scripts can also be opened in notepad after youve pressed save & encode to allow for tweaking). Well one thiong you write about more is cropping properly for the correct resolution and A/R. You suggest using the smart auto crop, which is fine, but I think you shoulkd mention the 'proper' resolutions, IE '720', '704', '672', '512', etc. And sometimes, GKNot's A/R "error" is incorrect; well not that its wrong, just that the intended A/R of the DVD may include black bars, which with XVID avi's should be cropped out. Do some more searching on here and SBiG and fileheaven (if you can) and copy/paste some random tips left here and there; then include them in this tut. For example, in GKnot, while you are cropping, watch the AVS preview in motion... if it decodes smoothly/fast then the resolution you are cropping to is 'more better'. In almost all circumstances you can get it 100% right (GKnot may say 0.01% error or something). Plus you should always use some noise filtering, GKnot ALWAYS adds UnDot() in the script. I suggest for beginners, that you also use MergeChroma(0.3)or(1.3) and either TemporalSmoother or Convolution3D(movieHQ). MAtrices are for advanced rippers, stick to the most essentially important (like you have): decoding, demuxing, indexing, cropping, and light filters. 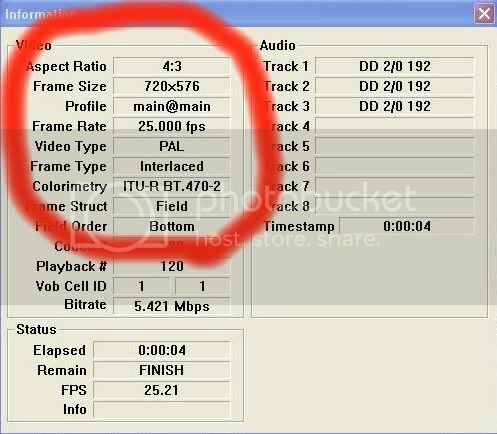 On a 2.4gHz P4 it should take about twice the length of the film, which is highly subjective. What you're talking about is more intermediate to advanced as youre talking about adding filters which means AVS script editing. You gotta remember back to when you were a beginner (however long ago that was) & how you also had to seek a lot of advice from various forums/people. What I've tried to do here is eliminate the need for people to have to do that. This is as basic & descriptive as I can make it & dont particularly want to start adding things that are only going to get people confused because like I said, I'm not good enough to start explaining to people these extras as I'm still having to seek guidance for them myself. Most importantly, if I start adding technical things to this beginners guide then people are gonna get confused & not even try it & go back to ripping with Magic Ripper or AGK which would be bad. 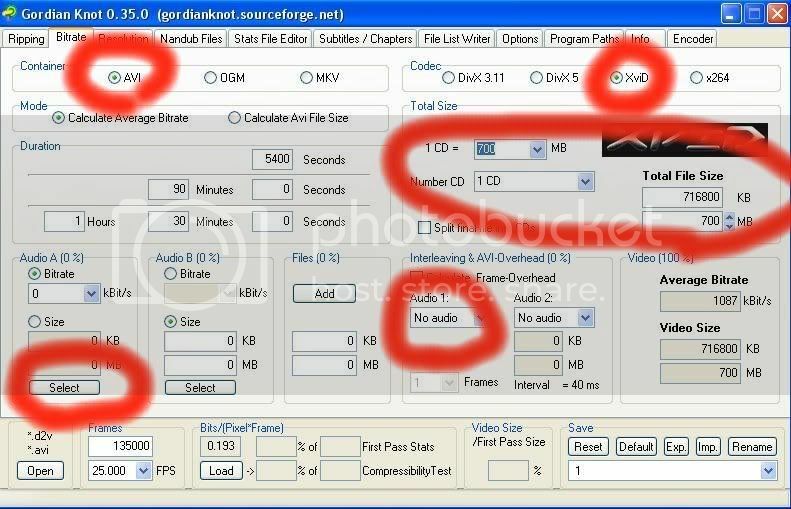 The default settings as theyre described here will ultimately make a superior rip to any of those crappy 1 click programs, but obviously once people get used to ripping with GK then they're ready to start filtering etc. Are you ready to write Grinds intermediate guide ? I'll quote some of what you just said in the guide though. Thanks. Thanks for your help man. I am testing this out now. I'll let you know how it goes What about these script things that lux has been posting on SBIG. How do they work? what are some good ones? Excellent, let me know how you got on & post in here any questions you have if you encounter any problems. What about these script things that lux has been posting on SBIG. How do they work? what are some good ones? Honestly, don't even think about scripts. Learn to walk before you try to run. There is no such thing as a good script. Theres a hell of a lot to them & Lux is simply experimenting with a lot of filters right now, so pay no attention. Keep to the basics first. Well all went good encoding it. but i went to play my avi to find it was MADLY undersized. I set it for 700 mb and it came out 225 mb. Any ideas? are you doing a 2pass? Are you encoding at a suitable resolution? whats your bits/pixel? ypu set the bottom right box as 700mb? Did you use the dropdown arrow in the top box & set as 1/6 or 1/3rd cd/dvd ? if you did thats where you went wrong. That sets as a fraction of a CD. Thats why I said to type your filesize in there. If not, please take screenies of this tab & your resolutions tab. Last edited by tenorbass on Sun Jun 24, 2007 6:43 am, edited 1 time in total.